What is the reason for recommended distance between objective and tube lens front element? Is it for minimizing impact of reflections off the surface of the tube lens? The opportunity of having of having this fairly large distance is the primary reason microscopes have changed over to infinity type optics. The various lighting and optical components between the eyepieces and the objectives that are currently used for some sophisticated techniques require this space. Nikon recommends a spacing of 100-200mm. Olympus recommends a spacing of 50-170mm. The manufacturers likely have designed and optimized their tube lenses around this fact and their objective characteristics. For our non-microscope uses it only serves to make for a longer apparatus since we rarely make use of this "infinity space". If you use a conventional camera lens you will typically want the objective very close to the front element so as to avoid vignetting. With an "official" tube lens this is not the case (unless you are trying to stretch the image to a larger format than the designers intended). I have not tried any detailed "study " of this, but I do know that if I place the objective right up against the Nikon tube lens I will see a very slight increase in chromatic aberrations towards the frame edges on an APS-C sensor. - What about the use of a simple achromat instead of a more complex lens? - What advantage does stopping-down the tube lens give? I would expect it only to cause vignetting. - Aren't the rays coming from the infinite objective parallel to the lens axis? And doesn't this make magnification relatively independent of the spacing between objective and tube lens? What about the use of a simple achromat instead of a more complex lens? Some simple achromats can work very well. The devil is in the details, so you have to test a specific model to know for sure. Aperture size and placement matters at lot, and there can be surprising results. One of the achromats that I tested clearly has a best-face-forward orientation, but which face that is depends on whether it's tested wide open or stopped down. What advantage does stopping-down the tube lens give? I would expect it only to cause vignetting. I have the same expectation, but there are a couple of fine points that could matter in some cases. One is that stopping down the tube lens just short of vignetting could also provide some baffling to reduce flare. Another is that stopping down the tube lens just past the start of vignetting could conceivably block some aberrated ray paths in the corners. I have heard of people getting slightly better results by stopping down the tube lens, but I don't recall seeing images to show the extent. Aren't the rays coming from the infinite objective parallel to the lens axis? That's a common misconception, but no! All the rays corresponding to a single point on the subject are parallel to each other, but none of them are parallel to the lens axis except for the one point at image center. See the ray tracing diagram HERE for illustration. And doesn't this make magnification relatively independent of the spacing between objective and tube lens? Magnification is completely independent of spacing, when the system is focused at infinity in the gap. If the tube lens is not focused at infinity, then the magnification will change somewhat depending on the spacing. As a quick summary, I can say that the topic is unexpectedly complex, but most of the effects are pretty subtle. Differences between tube lenses are swamped by differences between objectives, and while the differences between tube lenses are definite, I have to look close to see them. Posted: Sat Apr 06, 2013 4:37 pm Post subject: position of tube-lenses / measurments? I forgot to say: What a beautiful lens-setup - aesthetically and in function! So, as you have them for a longer time now -- how do they perform, in your eyes, compared to other lense -- and in which enlargement-range do you use this exotical/rare ones...? ... I also use and have installed the Thorlabs ITL200 on my bellows. Focused at infinity, total distance from sensor to rear element of the tube lens was 140mm +-2mm. This is only a preliminary measurement and was not undertaken with any exact measurement intentions. I do intend to revisit this matter. Craig, could you please report your measurements, if you find the time to this - perhaps for the Nikon and the Thorlabs. Thankyou for your time! I've found the 89S3 lens to be a top performer, up there with the best of the duplication lenses. It's a little long for most of the work I do so I don't use it often but it has very low longCA and is quite sharp. I use the 67S3 more often but it is a bit short for my setups so I only use it from M=0.5..2. I also have the 110S3 but have never used it so can't comment on performance. The 3 lenses were used in the Scitex S3 scanner and are often available in a set of 3. Perhaps the following test images will illustrate my "quick summary". Roughly speaking, what you're looking at here are 100% crops from the corner of a 39 megapixel full-frame sensor. 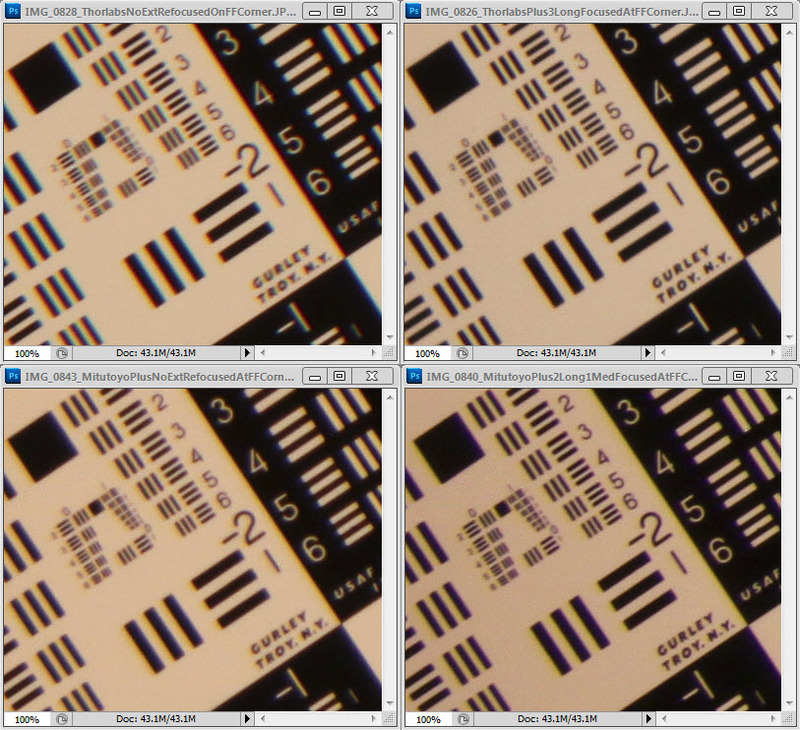 (They're actually from a Canon T1i sensor, radially shifted so as to cover one quadrant of full-frame.) The target is at 20+ feet, viewed through a circular aperture of diameter 11.2 mm, placed some distance in front of the tube lens. This setup simulates looking at a very small target through a perfect aberration-free objective with an aperture like 5X NA 0.14 or 10X NA 0.28 (effective f/18 at rated magnification). It provides a nice way to separate tube lens performance from whatever aberrations may be added by the objective. 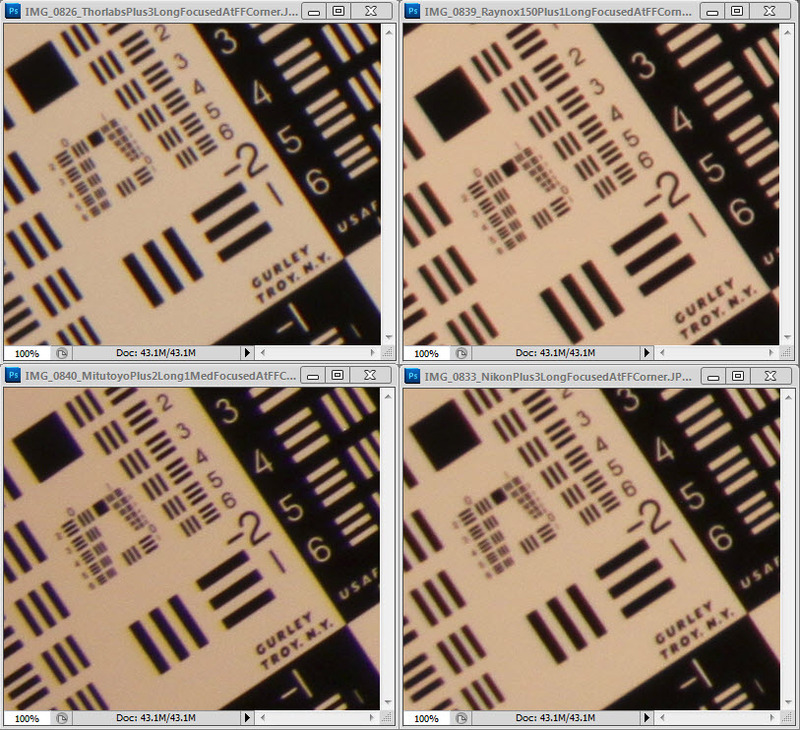 The Thorlabs has very little color fringing when used at recommended separation (upper right), but develops significant color fringing when used with no separation (upper left). The Mitutoyo has more color fringing than the Thorlabs under recommended separation (lower right), but it doesn't change much and has less fringing than the Thorlabs when used with no separation (lower left). Quick summary overall is that according to my tests the Thorlabs ITL200 beats Nikon MXA20696 (Edmund 58-520) ties Mitutoyo MT-1 beats Raynox 150 beats simple achromat (not shown). However, for focus-stacking applications the differences are small when each lens is used in its best configuration, and for the official tube lenses that corresponds to manufacturers' recommendations. thankyou very much for this survey, as I assumed -- according to all the testing with NON official "tube lenses" like even simple zoom lenses - and (sometimes far) outside of the range of 200 mm --that the distance from tubelens to microscopelens is not "super critical". So the Thorlabs ITL200 is described as APO-Corrected - it seems this is its benefit... and Apo-lenses have some influence. thorlabs specs are: 148 mm (image plane to back of tubelens + 28 mm length of tubelens + 90 mm to shoulder of microscope lens = a total of 266 mm up to the microscope lens -- is this correct? So rather a long tube then. So, what kind of misuse happens to the optical power of the whole in comparison, if we use the non official "tubelenses" so far outside the specifications as 135 mm or even down to 100 mm, as you showed it so nicely with the Nikon 10x/0.25 lens? Magic again -- or should we just forget about it, as it works? I've found the 89S3 lens to be a top performer, up there with the best of the duplication lenses..... The 3 lenses were used in the Scitex S3 scanner and are often available in a set of 3. The S3-lenses are true apochromatic-corrected, but - now - unfortunately no longer to be seen (on Ebay at least) since almost a year. They had been offered as a set, for a replacement inside Scanner-Setups- which were made by CREO (latest no bankrupt owner was Kodak ...) and were made by Rodenstock, Munich. ... I assumed -- according to all the testing with NON official "tube lenses" like even simple zoom lenses - and (sometimes far) outside of the range of 200 mm --that the distance from tubelens to microscopelens is not "super critical". This is a case of "it depends". Changing the separation can change several different aspects of off-center behavior -- notably CA, astigmatism, and flatness of field. The best separation for one aspect is not necessarily the best for another. For example some lenses I've tested (I don't offhand recall which) show best corner sharpness when there is significant curvature of field. Changing the separation can flatten the field but degrade best sharpness. That's why I specifically said "for focus-stacking applications", because focus stacking removes curvature of field as an important factor. From an image quality stand point I wouldn't really recommend the morfanon to anyone not using a FF sensor. I tried at least 10-15 different primes and prime+telephoto combinations before I got tired of it. With the Mitutoyo 10x/0.28 I could never get good edge/corner definition on FF. I imagine many of these solutions would have been great on an APS-C sensor though since contrast, center sharpness etc often impressed me and the "good" field often extended at least beyond the height of the frame (24mm). What I liked with the morfanon was that with some objectives (Mitutoyo M Plan Apo 10/0.28, Nikon CF Plan 50/0.55 EPI ELWD) it gave a very consistent performance across the frame on FF – even at lower magnifications. What is special about the official tube lenses is that they are specifically designed for good optical performance with significant separation between the tube lens and the objective. It turns out that some other relatively thin lenses like the Raynox 150 and some simple achromats also hold up well to significant separation. In some cases the image quality gets better with say 25-50 mm added separation than it is with a minimum adapter. Yes, that's correct. It's quite a long setup. You know, I really wish I could tell other people how to get the "best results in their setup". But I can't. In addition to the complexity of what happens with different lenses, there is the huge problem that different people have different criteria. Personally I tend to weight sharpness over color, so if you give me a subject that is 4 mm long I will reach for a Nikon CFI Plan Achromat 10X NA 0.25 (MRL00102) and push it down with a short tube lens so that I have say 5X NA 0.25 with significant axial CA. In contrast, one of my friends is very sensitive to color -- he will reach instead for a Mitutoyo Plan Apo 5X NA 0.14. Even though we agree completely on what the lens characteristics are, we disagree emphatically about which lens is "better". 1. Do the official tube lenses cover full frame? Yes, optically. But beware: the long distance from sensor makes them vulnerable to clipping by other components. Having a thick-walled extension tube mounted on the camera is practically guaranteed to cause hard vignetting with a full-frame sensor. 2. Does separation between tube lens and objective matter? Yes. Follow manufacturers' recommendations if available. Otherwise, test to optimize against your own criteria. 3. What tube lens would I recommend? Thorlabs ITL200; unless cost matters, in which case Nikon MXA20696 (Edmund 58-520); unless convenience matters, in which case Raynox 150 or a telephoto because all the required adapters are cheap and easy to get. In other words, "it depends". 4. How does an "ABC" tube lens compare to some particular "XYZ" telephoto/enlarging/process/viewcamera lens? I have no idea. If you have one, test it and see if you like the results. I try to organize my testing to get information that can be reused as widely as possible. As a matter of practice that means restricting my efforts to lenses that are routinely available, typically still being manufactured. I don't know what sort of information you're looking for. Can you specify more precisely what you want to know? I think this is a good sourse to information about optical systems, it has some answers to questions that been asked here. Dear Rik,---thankyou again for all that super clear listing - very helpful for all of us... sorry for my poor english. WHICH - that you have uses with half of the "official" length of tube lenses - down to 100 mm have worked for you -- at least on APS-C...? So -thankyou for this much much time you spent already on this perfect test of the best use of/with the tubelenses --could you report as "summary of your memory", which of the lenses in YOUR lens-arsenal worked well (without hard issues) on a 100 mm odr 136 mm tubelens? If you can share your thoughts on that, would be appreciated, as allways. This question is shorter than the version I saw earlier today. Apparently your posting has been shortened by some editing, which the forum does not indicate because there were no replies by the time of the edit. Nonetheless my browser kept a cached copy of your earlier version, which I found helpful in understanding your question. I believe you are now asking about objectives, not about tube lenses. 1. I do not know any objectives at any magnification that will cover full frame when pushed to half their rated magnification by 100 mm tube lens. 2. The Nikon CFI Plan Achromat 10x NA 0.25 WD 10.5mm (part number MRL00102) and Nikon CFI BE 10X NA 0.25 WD 6.7 (part number MRN70100) will definitely cover APS-C when pushed to 5X by 100 mm tube lens. This implies that they will also cover full frame at 8X on 160 mm tube lens. The Mitutoyo Plan APO 10X NA 0.28 -- at least my sample -- does not cover APS-C at 5X or full frame at 8X. Other people have shown good results with their Mitutoyos at 10X on full frame. 3. For me the Nikon 50X/0.55 EPI ELWD definitely works OK over most of an APS-C frame when pushed down to 25X. I don't remember if the very corners are clean. The Mitutoyo 50X/0.55 appears to be similar on quick look, but I haven't done any serious testing yet. 4. None of my 20X Nikon objectives will cover APS-C at 10X. I don't have a Mitutoyo 20X to test so I don't know about that one. I am using these "tube lenses" with 20mm separation in case of the DCR's and 30mm separation in case of the X6 lens. Would you recommend adding extra separation?Normally I use an Iris, would you recomend the Iris to be closer to the tube lens or to the microscope objective? For example, I feel I am geeting poor corner performance with the DCR-125 and nikon CFI 10/0.25 , could this improve with extra separation? Also, is it possible for a tube lens to perform well with some objective and not so well with others? Yes, for the "power" of objectives on other tube-lens lenghts as 200 mm. And is a good orientation for the possible expectations for many users here, I believe. As I have allways been curious, what the professional users here experienced in this "pushing down" the microscope objectives.